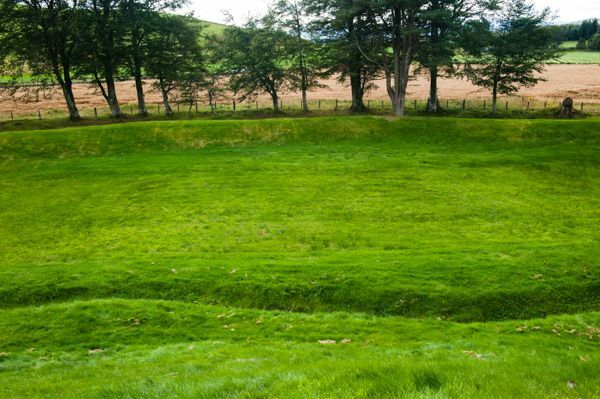 One of the fascinating medieval sites in Grampian, Lumphanan is an earthwork motte, the site of one of the earliest Norman fortified houses in the north of Scotland. 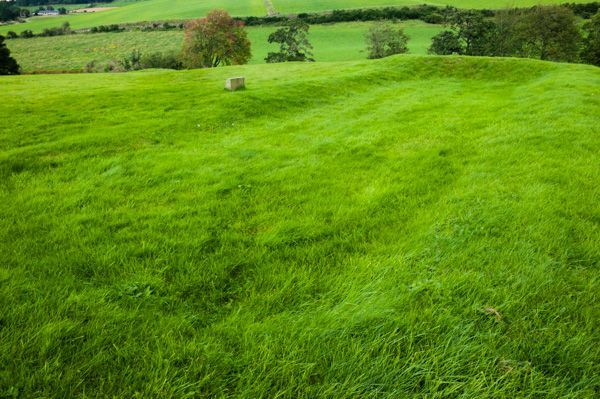 Lumphanan Peel Ring dates to the late 12th or early 13th century, a period when Norman lords were pushing north into the old Celtic Earldom of Mar. One of those Norman families were the de Lundin family, who acquired a large estate between the Don and the Dee sometime around 1228. The de Lundins were traditional 'door wards' to the king, a sort of glorified usher. From the post of 'door ward' came the later family name of Durward. The de Lundins established their seat at Coull, but the built a secondary residence here at Lumphanan. 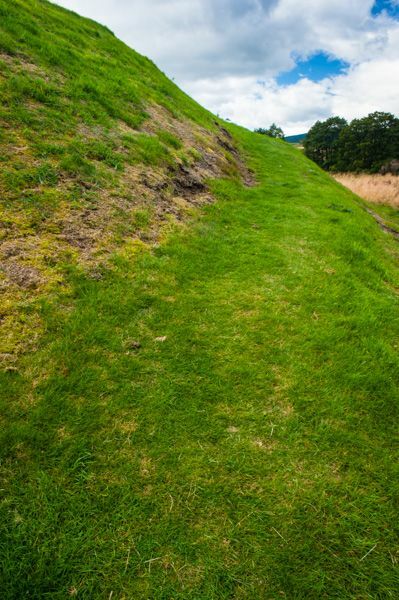 Rather than an expensive stone castle, they built an earthwork with a timber palisade, or 'palacium'. It is from this Latin term that the Peel got its common name. The only time that Lumphanan Peel enters the pages of history is in 1296 when Edward I of England was pushing north to exert his claim to the throne of Scotland. He stopped at Lumphanan Peel to receive the submission of the Scottish lord Sir John de Melville. Nothing more is heard of Lumphanan, and we can only presume that it was never important enough to rate a proper stone residence. 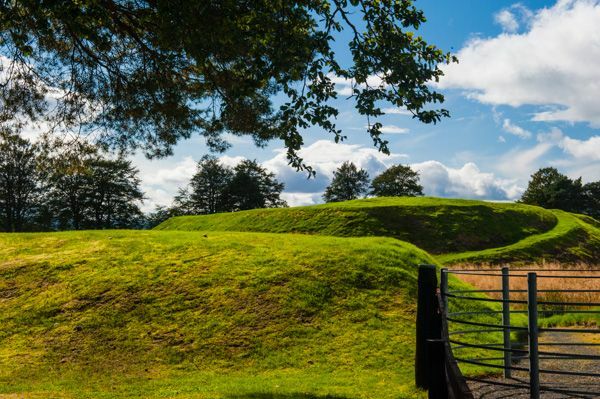 We do know that in 1487 Thomas Charteris of Kinfauns, Perthshire, built a small, simple hall house atop the old motte. This house, called Ha'ton House, can only technically be called a manor; when you look at the foundation walls laid out on the lawn it seems hardly larger than a simple croft. By the 18th century, Ha'ton House was abandoned and crumbling into dust. 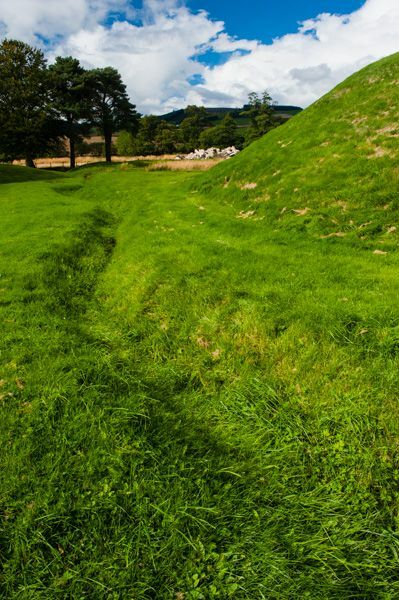 In the 19th century, local villagers used a level area inside the lower earthworks as a curling rink in winter, and you can still see the layout of the rink on the grass. 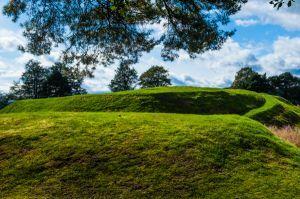 There are no remains at Lumphanan beyond the motte and sizeable earthwork defences; no stone remnants of any buildings. The site is located in a peaceful farming area and seems somehow lost in time. Lumphanan itself is strongly connected with one of Scotland's most famous kings, Macbeth. Not the Macbeth that Shakespeare embellished and vilified beyond all recognition, but the real Macbeth, who ruled from 1040–1057. A contemporary account records that Macbeth was killed, not at Dunsinane, as Shakespeare would have it, but here at Lumphanan. Another account says that he was mortally wounded here but later died at Scone, and was buried on the Isle of Iona. 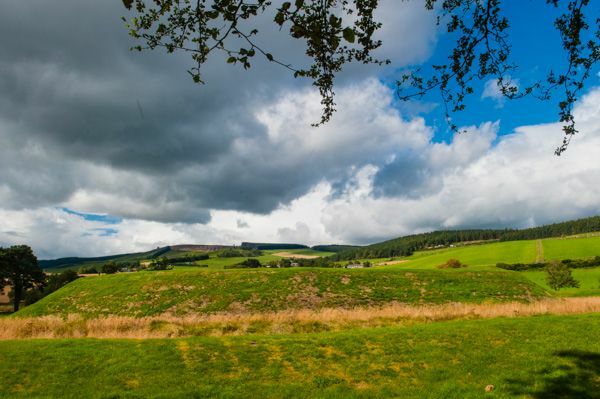 Within a few miles of the Peel are 3 sites associated with Macbeth's final battle. At Burnside, near the church, is the well where he drank before the battle, and 300 meters south-west of the Peel is Macbeth's Stone, marking the spot where the king was beheaded. Finally, to the north of the village on Perk Hill is Macbeth's Cairn, marking the traditional spot where the king was buried. Truth or legend? We can't know for sure, but it does add a bit of intrigue to this quiet countryside site.